to facilitate development of faith group networks of volunteers, collaborations between faith groups and with health and advocacy groups. -2000 The Board of Representatives in March reluctantly voted to dissolve Pathways to Promise due to the drastically reduced financial and staff support of its major members, the national faith groups. Following overwhelming expressions of gratitude for Pathways’ services, and after much consultation, the Board voted in September to move Pathways to “transitional status” in order to explore all possible avenues for continuing its services. -2001 The Spring Newsletter announced “A New Beginning: Pathways Continues with Renewed Energy,” and promised to explore new sources of funding along with new ways to support and expand Pathways’ work. Major support came from the Missouri Institute of Mental Health, which has provided office space and additional assistance, as well as collaborative programming. 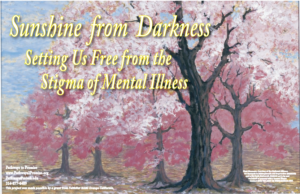 “Sunshine from Darkness”: in collaboration with the American Psychiatric Association Foundation, Pathways distributed nationwide 25,000 posters featuring art contributed by NARSAD Artworks, awareness information, and resource materials to congregations in 10 faith groups. Follow up consultations and technical assistance helped congregations in starting or expanding mental illness ministries. Walking Together; the Community of Faith and Mental Illness” an interactive training workshop for faith communities in educating congregations, and supporting people with mental illness, was developed and distributed in collaboration with the Auckland Anglican Church of New Zealand; a United States version was developed for use in this country. Acting Executive Director Bob Dell in 2007 represented the faith community at the “National Wellness Summit for People with Mental Illnesses,” a conference sponsored by the Center for Mental Health Services, on integrating primary medical and mental health care. Pathways participated in the launch of Chaplain Craig Rennebohm’s book “Souls in the Hands of a Tender God” through Reading Circles and workshops in Seattle, Chicago, and St. Louis, and in continuing education workshops for clergy. Pathways have provided leadership for similar workshops in Phoenix and Chicago, and has participated in NAMI conferences and in the development of NAMI FaithNet. As more local and regional groups develop their own programs, Pathways is increasingly called on for consultation and coordination, rather than originating conferences; the 2009 National Faith Based Mental Health Summit is a notable exception promoting innovative models of ministry and collaboration: Pathways for the 21st Century.